No socks today. After you've picked yourself up off the floor, (after all, its been all socks, all the time here at PLT lately), look at these! 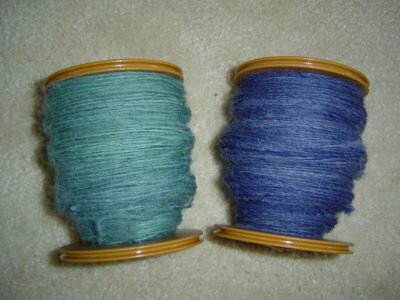 I've been spinning on these for a while and these are my third set of singles ready to ply. The good news is, I think I've found a pattern to use with this yarn. The better news is, I think after I ply these, I'll have enough yarn to knit the pattern. What pattern you ask? The Granny Smith Cardigan. If you haven't seen this pattern, go back and take a look, we'll wait. Isn't it cute? The pattern is written for Kid Silk Crack, and I might just have to do one in that too (I'm seeing a cute little number in the black Kid Silk Night for evenings). According to the pattern information, I'll need just under 1000 yards and my first two skeins were each in the 500+ yards range. I'm thinking for my handspun version, I might make long sleeves on it, but that shouldn't be hard to alter. I'm still knitting away on Mystery Stole 2006, double checking charts and making sure all the designing was correct. The first clue goes out next Friday, July 7. There's still time to join and get in on the fun, but time is running out. You can knit this anytime, but I will close the group to new members on July 14, when the second clue is posted. I'm hoping this keeps us more on track than we were last year. If you haven't joined and you want to, just click the words "Mystery Stole 2006" above and it will link you to the group's page. In the meantime, I've started another project (because I'm not quite busy enough!) Starting tomorrow is the Tour de Fleece. It's a spin along based on the idea of the Knitting Olympics, coinciding with the Tour de France. So, for my challenge, I will be spinning at least 30 minutes a day from July 1-23. I figure this will help me get some of my stash spun up, give me something to show on the blog other than socks, and it might help me get started spinning a little every day. how exciting! i can't wait to see Grannie Smith knit up in the homespun! That's my goal, too--at least 30 minutes a day. I have no problem on the weekend, but during the week I get really lazy. Good luck to us both! hey! just wandering around the web, and saw this post. i'm almost done making a long-sleeved version, if you want some tips - i made mine about two inches too long and it's driving me crazy. i'm so close to done, and i have no ambition.